Posted this morning, this stands among the more spectacular can openings to occur beneath the 11-foot-8 bridge at Gregson and Main. 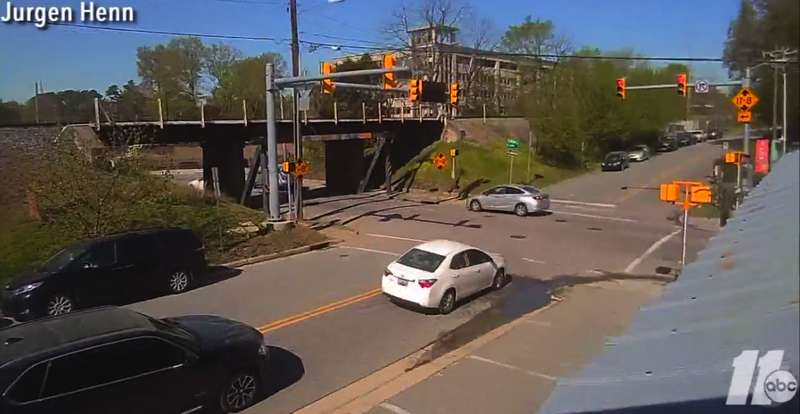 In the evening hours of March 28, a semi truck hit the 11foot8 bridge in quite a spectacular fashion, at pretty high speed scattering debris across the intersection. Luckily no one was injured! The busted semi trailer was wedged under the trestle for over 90 Minutes before the recovery operators were able to winch it out of the canopener's "jaws" ... the beast has been fed! This was crash # 145 since April 2008 ... and probably the biggest mess we have seen here, yet. 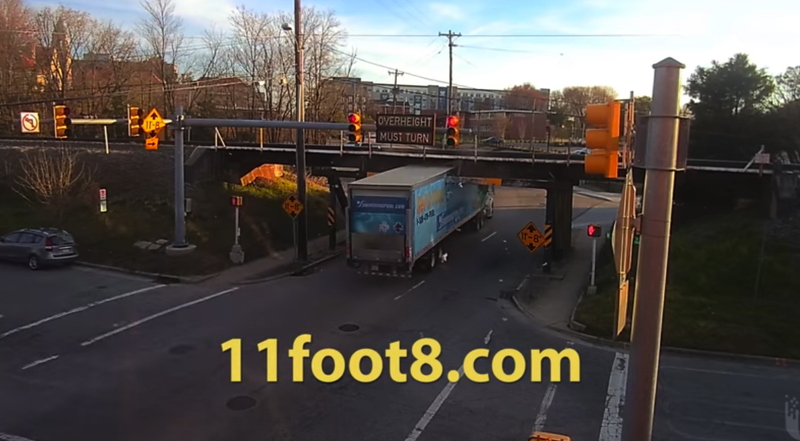 Here's some welcome news for people who enjoy watching videos of trucks getting their roof scraped off by the notorious 11 foot 8 Bridge (aka The Can Opener) in Durham, NC: the guy who runs the YouTube channel has added another camera so you can see the action from two angles. 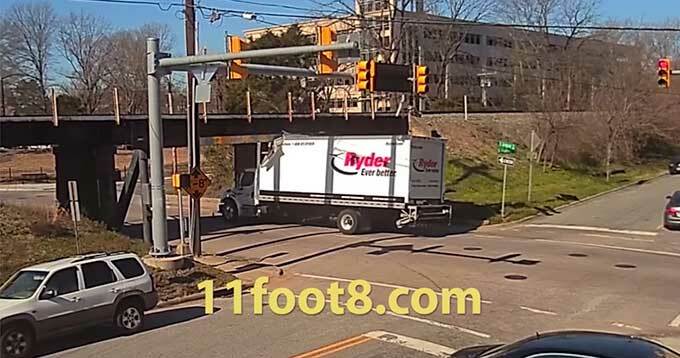 This time a truck got stuck under the bridge, necessitating a tow truck to extricate it. This is the sequel to this week's "Attack of the reefer trucks," and this time "umbrella man" (on the right) has to run for his life to avoid getting hit by the flying debris. 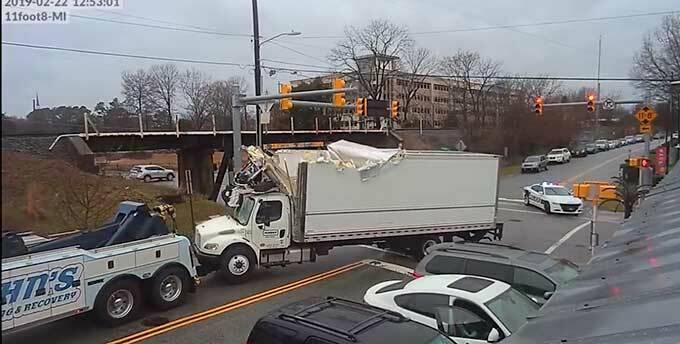 This time the bridge wouldn't let go so easily of the truck, and so they had to bring in a big tow truck to remove the busted reefer truck. The entire operation took almost 2 hours, during which Gregson St. was completely blocked off on a Friday at lunchtime! This road has a traffic volume of 11k-12k vehicles a day, so traffic was a mess, too. Enjoy the video! This is crash # 143 since April 2008.